anyone happens to know about the old Sycamore Grove Amusement Park? The Park had an odd history of closings and reopenings throughout the years and to this date is closed up once more. an old brochure with a bunch of other stuff indicating that we visited the park sometime in the 1990's. That sparked my interest and so I started looking up stuff on the park on the internet and came across a couple of pictures which must have been taken in the very late 60's. The signature ride since early times was the "Shootin' Star", also there was a "Bobsleds" sidefriction kind of rollercoaster, although the owners often received criticism for the wilder interpretation of what those rides could do. Hyperspin ride to the left, Haunted Castle, Bobsleds and Shootin' Star and the Zipper. 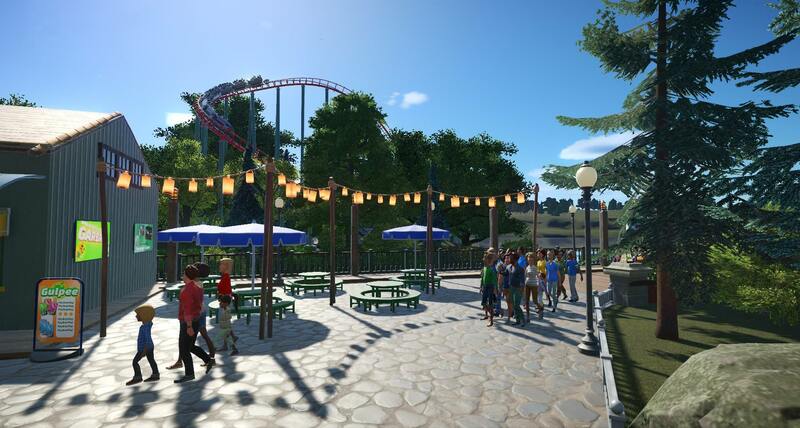 This is the old park area. 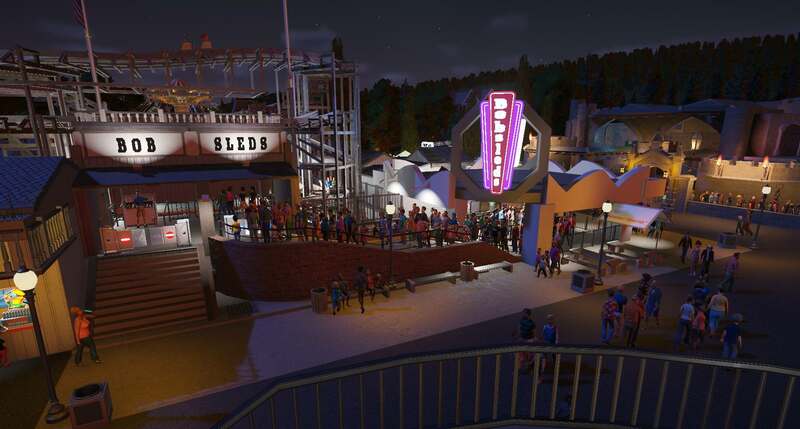 The lines were always long at the Shootin' Star and the Bobsleds. 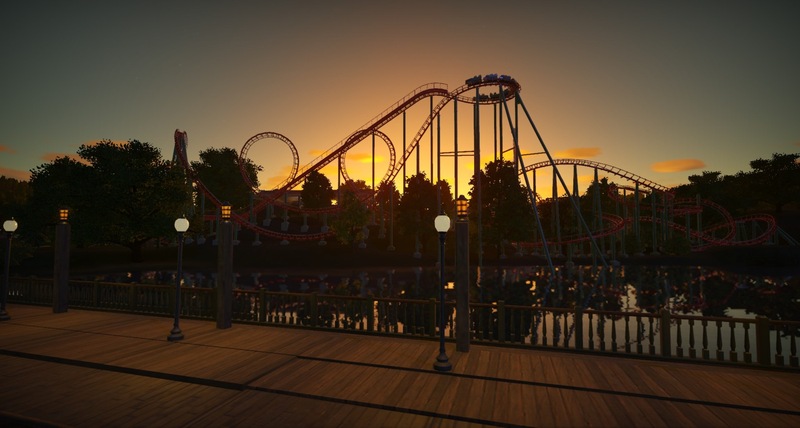 There was always an uplifting atmosphere, people were having a good time and enjoying an evening out at the park. Love the unique presentation. 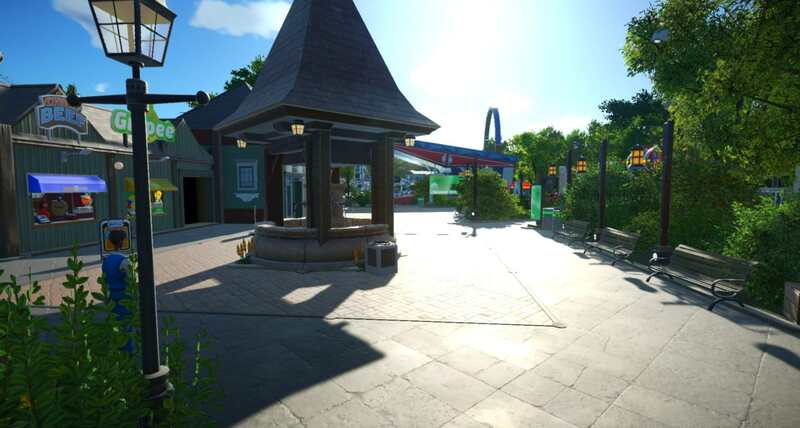 I hope you're going to continue to "research" this park and post more pics of what you find. Like your presentation! Looking forward to more! Couldn't find a real Sycamore Grove so kudos for the convincing presentation of it being real . And what you show in the pics so far looks quite impressive. I look forward to seeing this story develop. Nontheless, I found a couple more pictures in a box and scanned them for you. Seems they must have been taken sometime in the 80s maybe? 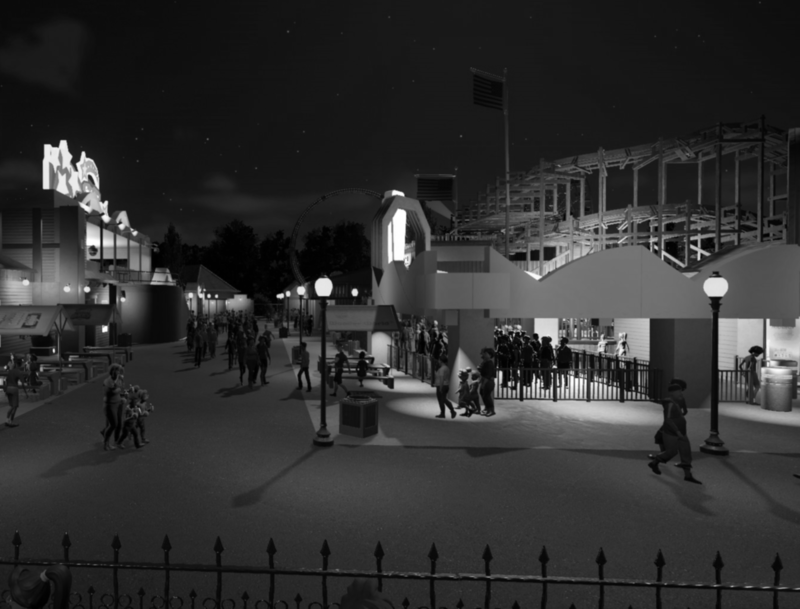 Kinda hard to tell, the rides could all have been build since at least the 1950s if not way earlier. If the Chairswing is a model manufactured by Zierer / Schwarzkopf, the pictures must have been taken after 1972. This is an earlier pic from a trip my parents took. There was a large construction site, this was to be the future Bus Station. They redesigned the whole area it seems. A photo taken from the inside of the entry gates. I could've sworn there was another mascot at the entrance besides the dinosaur, the squirrel pictured in the brochure. Gonna look into that again if time allows. Turning right you'd enter a small village kind of area with a vintage car ride. It had some nice theming going on and was a popular ride throughout the park's time. Also featuring Dad's high rise angle again, that mad lad. In front of the vintage car ride was a small plaza kinda area with a small well. The Memory Lane Midway (or at least that's what it was called when we visited) begins in the back of the picture. 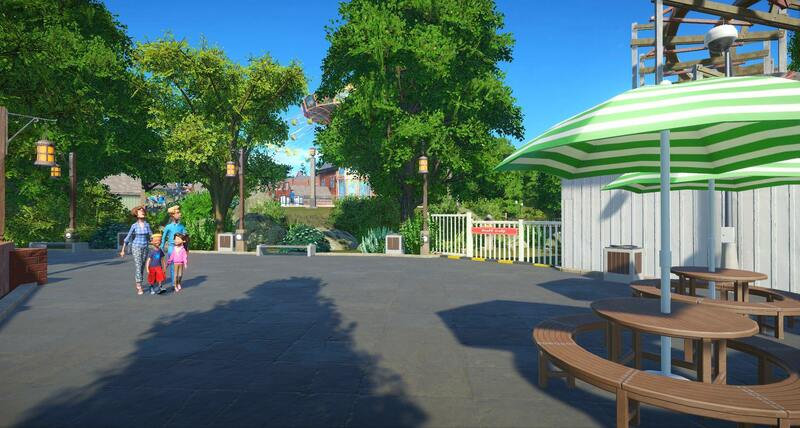 This one shows the front of the park, with the chairswing, vintage car ride and a balloon ride. The Ferris Wheel was nicely located on a small ridge. 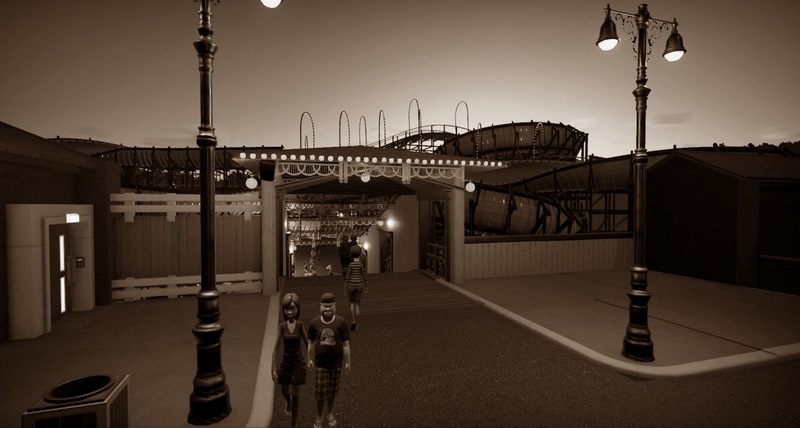 Lastly a photo taken from the exit of Shootin' Star, showing that the Bobsleds ride was still popular. People still sometimes complained about the roughness, other folks enjoyed the ride for that matter. If you find out anything about the park or notice something in the pictures that I have overlooked, drop me a line. I wanna find out as much as there is about Sycamore Grove! I particularly admire your path work here. 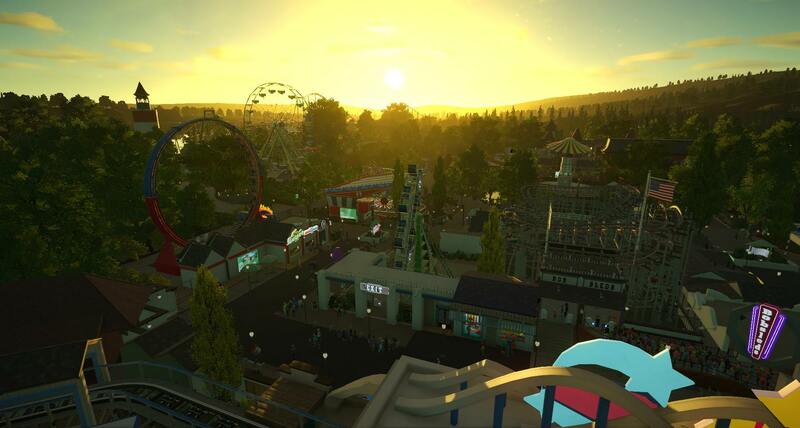 I love that shot from the ferris wheel! 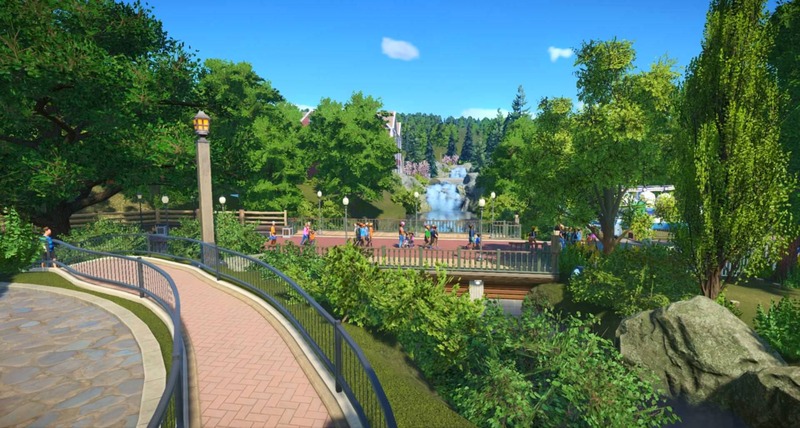 The red brick pathway area looks really nice. Keen to see some close up shots of that area as you progress. Just wonderful! I love the classic old park styling . Really nice! Thank you again for the feedback. 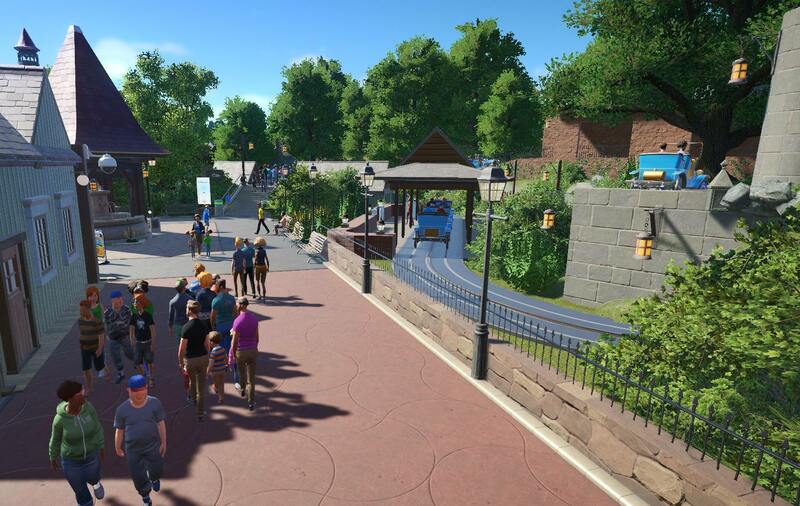 I'm very excited to post between all those fantastic, intimidating other parks. You guys keep me going whenever I find the time and trying to get better! Now let's go back in time to Sycamore Grove! 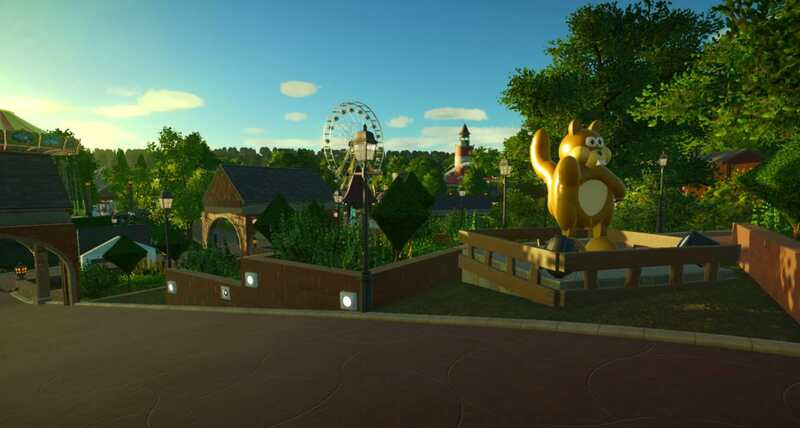 Anyway, on to a couple of unsorted pics which must be from around the same time frame but also show a different part of the park I don't remember much. It was basically a small coaster, a kiddie ride and a couple of snack bars assembled around a lighthouse. 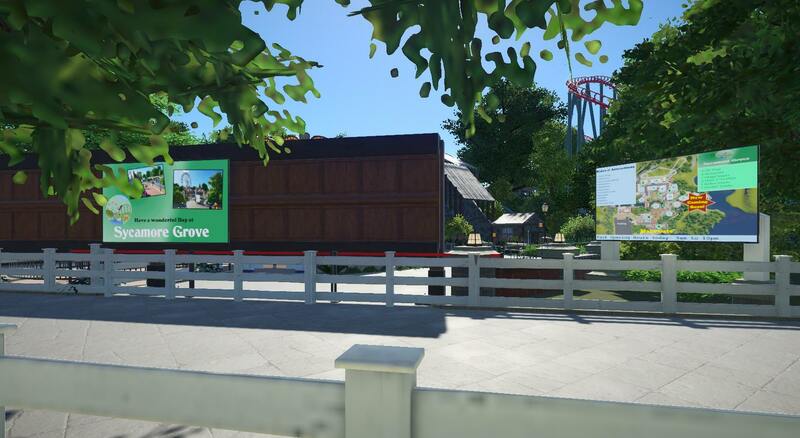 Seems like the park kinda got into the idea of theming, but without the immersive storytelling we see nowadays. Entering the park you were greeted by the squirrel mascot 'Nutty Sam'. 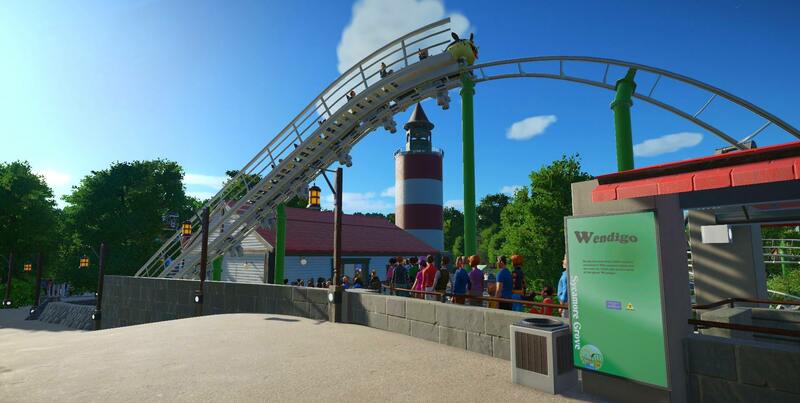 The kiddie coaster is just beneath the lighthouse. Taking a left, you come around a corner to this view towards the Memory Lane Midway, Haunted Castle and Shootin' Star. The cool and misty morning quiet will soon be gone. 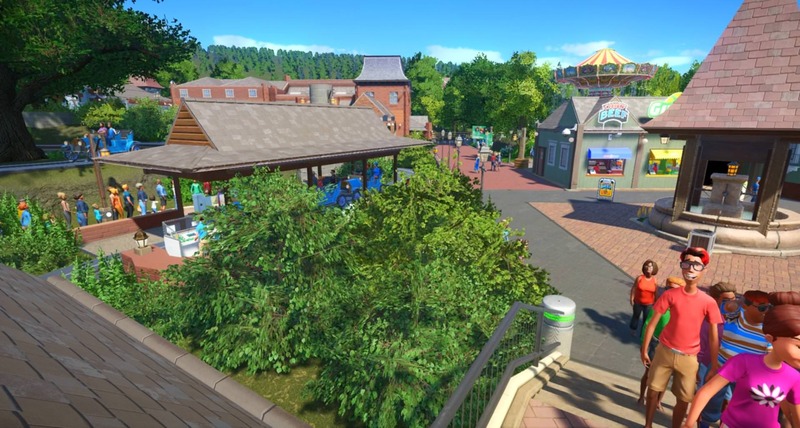 If we were to turn right at the bottom of the entrance, we'd see the village market plaza kinda area with the vintage cars. 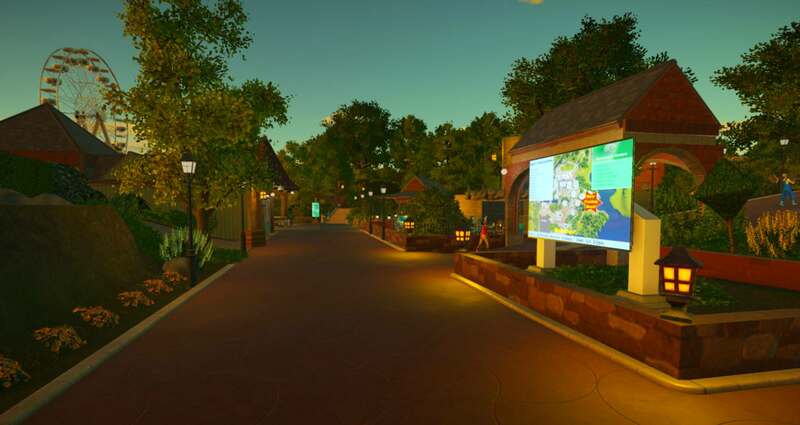 The park map also teasered a new ride near the parks entrance. 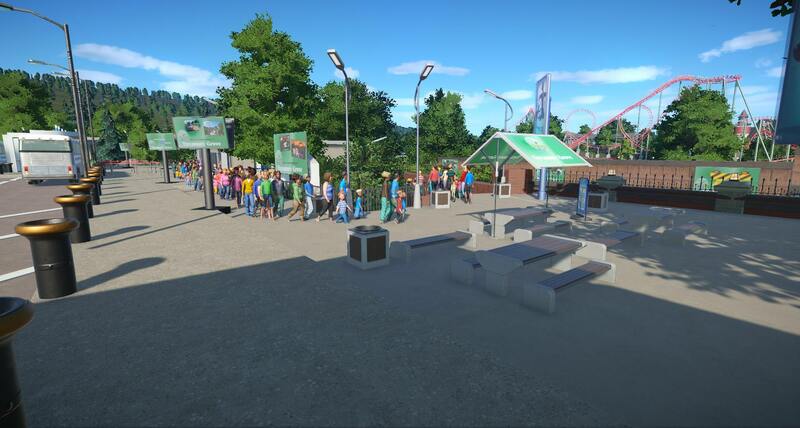 The day really picked up and crowds were gathering everywhere. Mostly families were coming to the park at this point and the managment decided they had to extend the property. The theming was mostly 'nature' and 'rustic buildings' at this point like a lot of smaller parks at that time. It was affordable and still provided a sense of immersion then and nostalgia now. Exiting the vintage cars and blinded by the sun, we move on towards the Weisshorn ride. As said, nature. Trees, bushes, green. But I like it, moreso than the IP overload of today. This is taken from the queue of said chairswing. Turning left at the entrance to the Big Wheel, we will soon arrive at the lighthouse. Coming up the path or exiting the Big Wheel, you would then be greeted with this view. 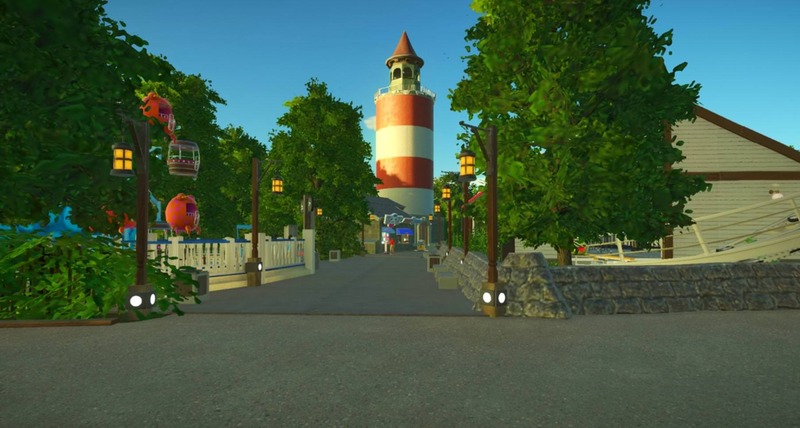 I definitely remember more of a maritime theme around here, but then again, the park may have added that later on. They probably opened this area as soon as they could to get some cash back in. Taken from the Big Wheel, a bird's eye view of the area. 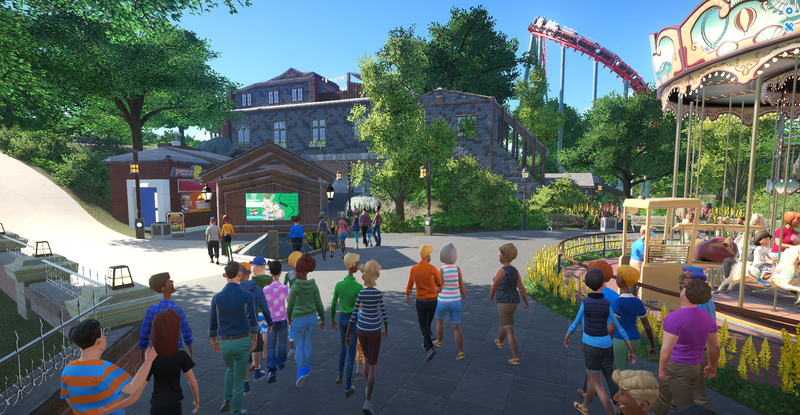 Seems like it was a good investment, as mostly families were visiting and thus the Wendigo was a perfect addition to the parks lineup at that point. Whenever they had the construction fences going up, people got excited. 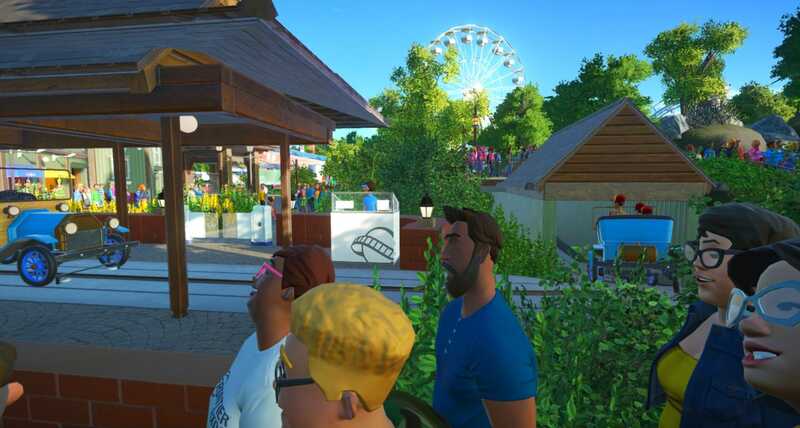 Not only did the park map tease the new attraction for a while now, but actually being able to see stuff being build was even better. Whatever it's going to have been (that make any sense? I'm not a native speaker ), it put the park on the map for sure. So lovely! Picture number 9 is my favorite...I love all the trees and the view of the waterfalls. Very lush and green! Looks really lovely. I agree with Fisherman, I love that shot of the bridge and waterfalls in the distance. I love this unique presentation style. 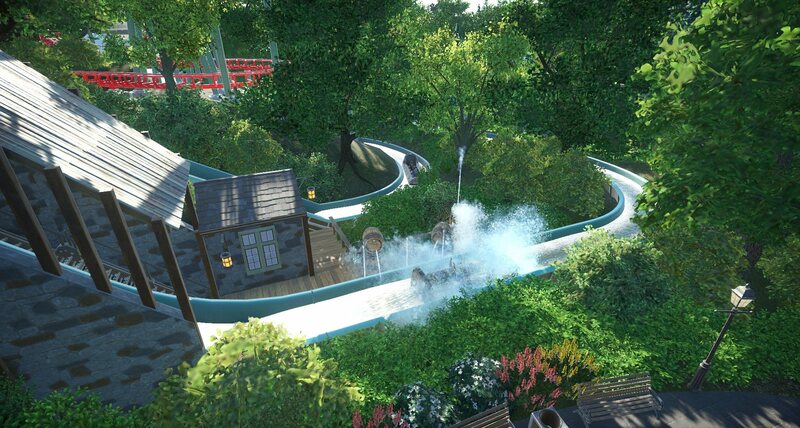 I did a variant of this when I started a park in RCT3 but ended up ditching it because it was so time consuming with the photos. I look forward to your continuing updates. @ ALT2870: Nice, which park was it? Is there any old thread left on a board somewhere? 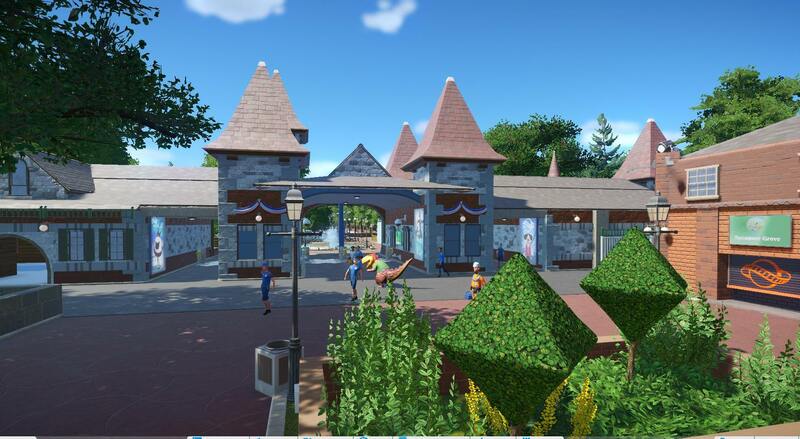 Let's end the weekend with a couple more pictures that brought some closure to parts of the park that weren't shown much. 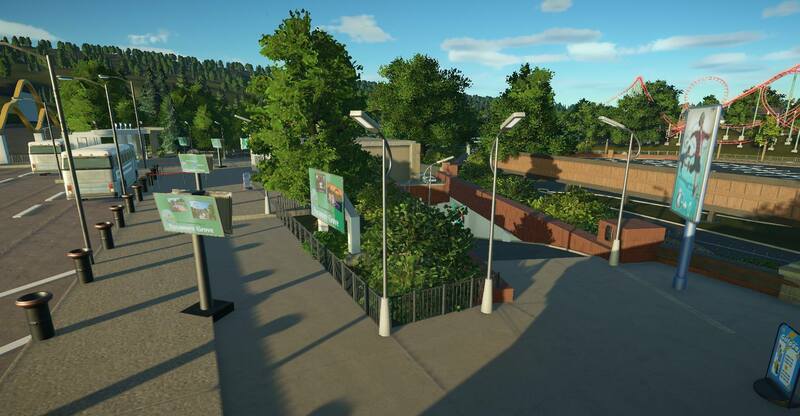 The park added some public transportation offers to their portfolio. You'd have to use an underpass in which some facilities were located. Still, the view of the soon-to-be-opened new rollercoaster was a feast for the eyes. Exiting the underpass you'd reach a boardwalk that would take you up to the park's entrance. Seems like they were already testing the new ride. 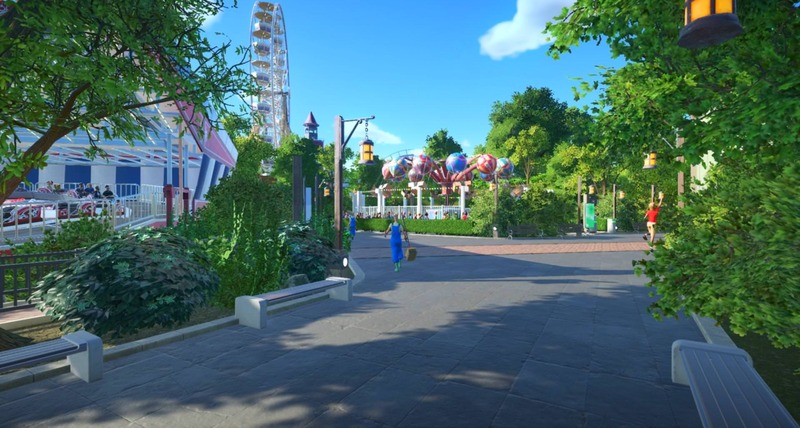 This is such a charming park! I love the quaint feeling and the atmosphere. Very well done! 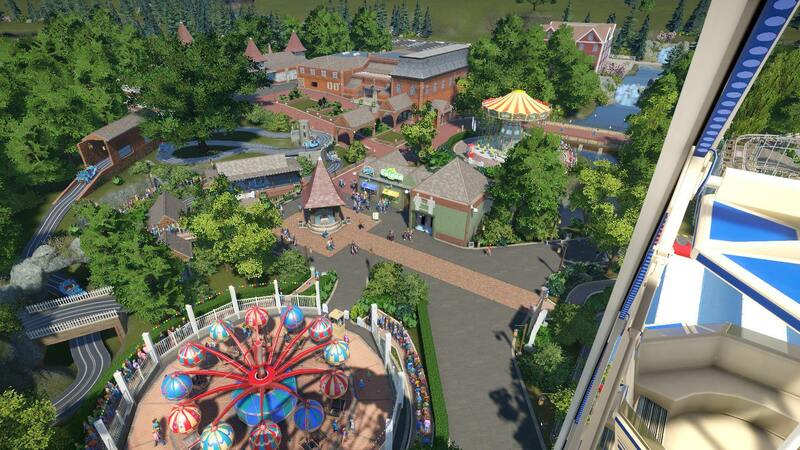 Might there be an full overview of the progress so far? Dinoco, this park just keeps getting prettier and prettier. 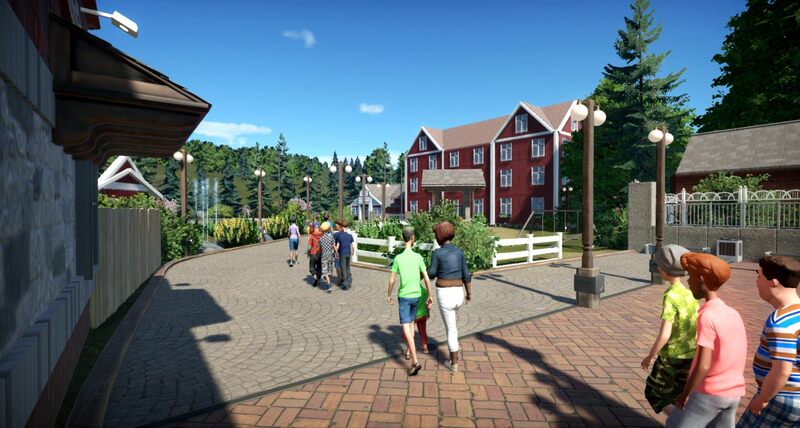 It's got such a feeling of fresh air and sunshine all tastefully arranged and emphasized by the path layout and buildings. It's a place where cares can easily slip away. Arrows are such a god addition to your skyline. 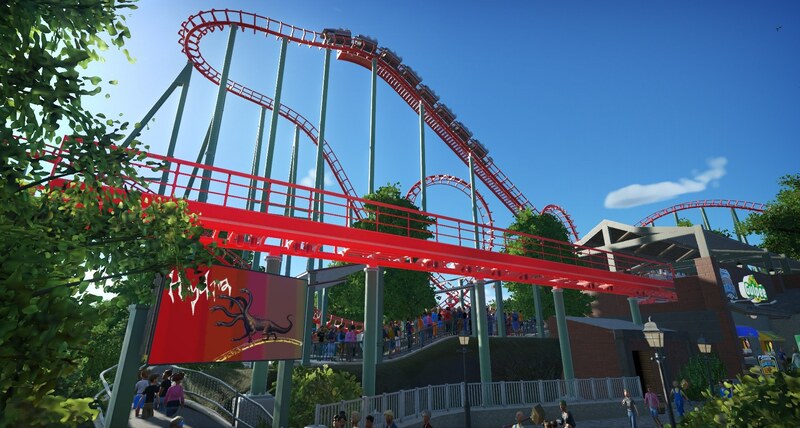 Just the shape of the loops and the lift hill structure.. Looks amazing! The only thing that seemed a bit off is how steep that path is in the last picture to the left. I think that needs to be way less steep or converted to stairs if thats possible? 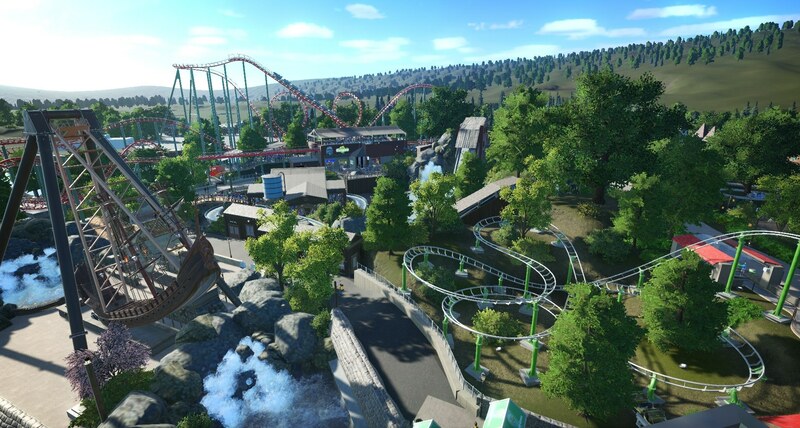 Otherwise, I also really loved that waterfall shot from last update. Bullethead, such kind words You're right, it's all about the atmosphere of a park. I'm glad if I could convey what I had in mind. As I haven't had much time playing, let's start the week with two pictures showing two new perspectives. 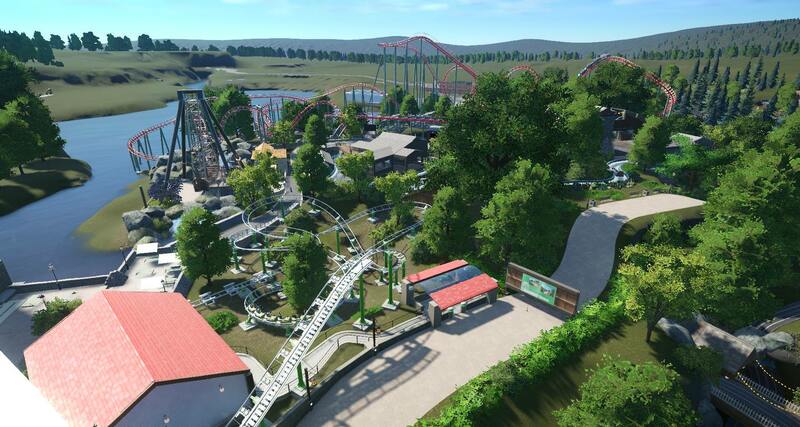 From the top of the lfithill of Shootin' Star looking towards the park's entrance. Love that sunset picture. Looks almost real! A late thank you to you, citytrader. I took a break over the late summer, my workload doubled plus we were preparing for a two week trip to Walt Disney World. Now that everything has kinda calmed down I can continue digging into Sycamore Grove's history and found something about that red house in the background of one of the pictures. 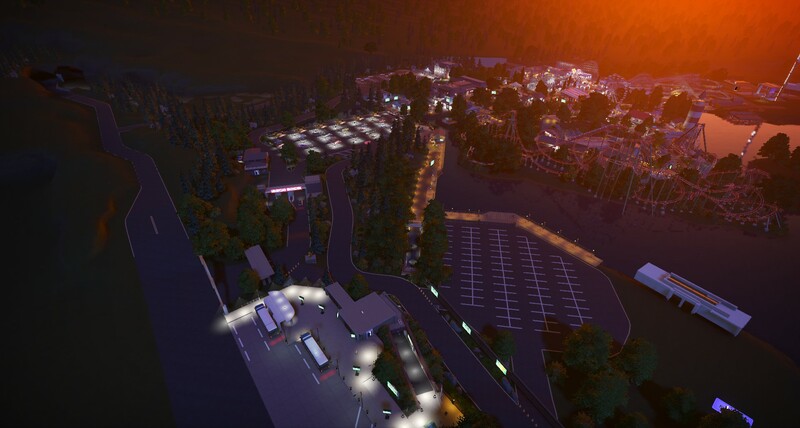 Shortely before the new big expansion would open, the park added a small hotel since it was becoming more and more popular. 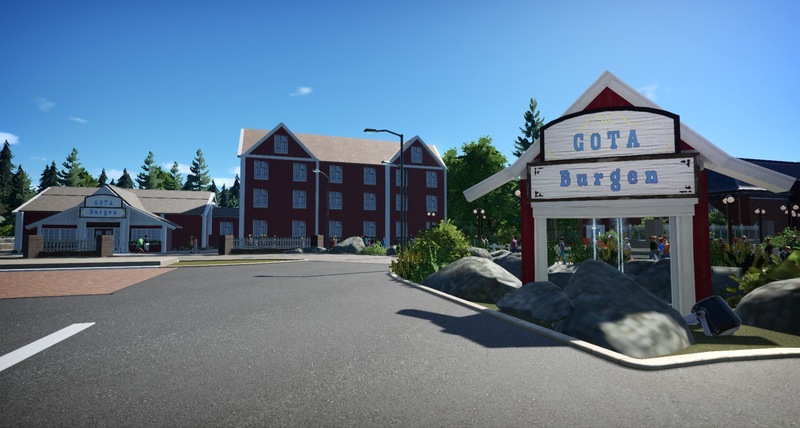 To prepare for the expected step up in the numbers game, Gotaburgen with about 48 rooms was built, including a small restaurant (more like a quick serve, though) and a terrace still under construction. 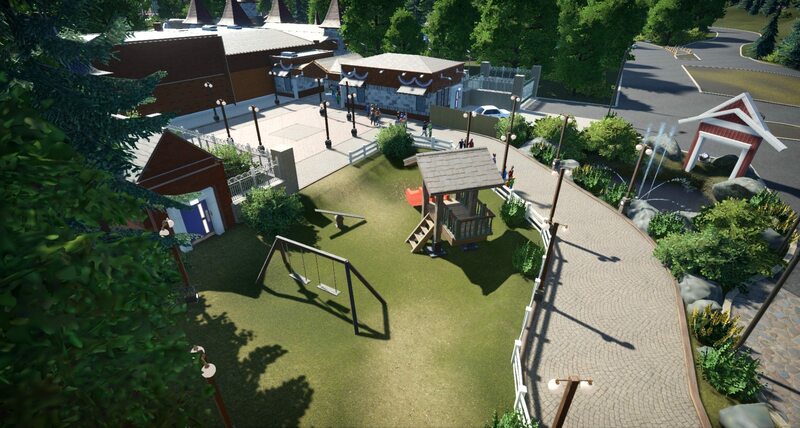 It was nothing special but should serve the park well. First couple of guests won their stay in a sweepstake, the other rooms were quickly filled up. There was a tiny playground and the guests had an exclusive park entrance to the side of the main entrance. 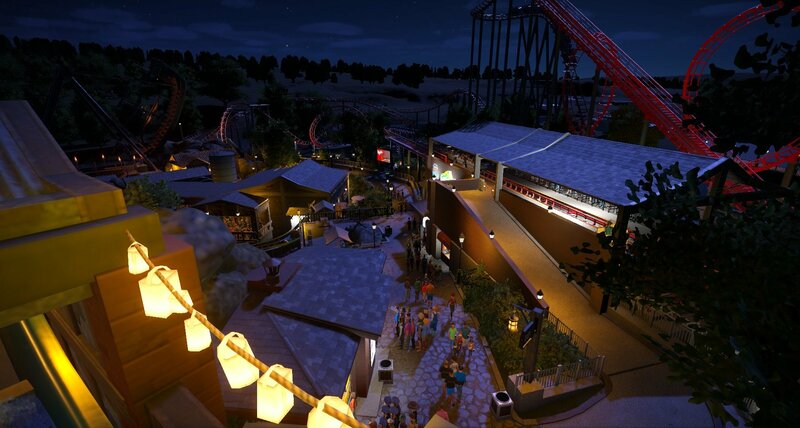 The extended Boardwalk allowed for spectacular views at night. 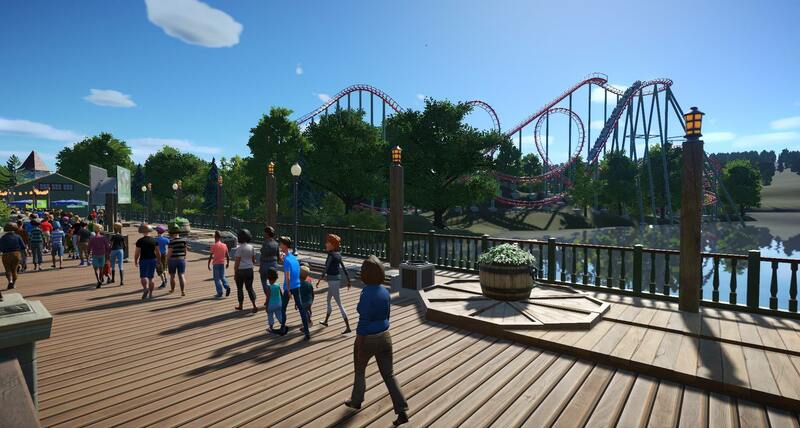 Hope you're all enjoying the World's Fair and Free Update, also I'm pretty excited for what will come around when Gamemakers Toolkit will be released. Wonderful, dinoco!! 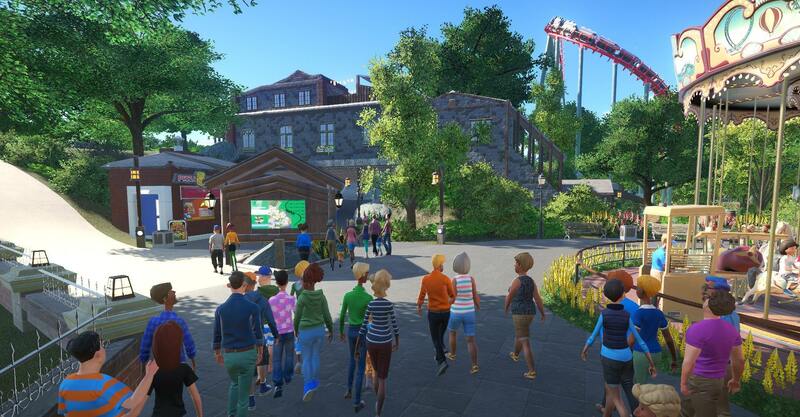 I love the traditional park feel! Yay, it's back! Glad to hear you're workload has settled into a stable configuration and you can get back to this project. How was the trip to Disney? Anyway, I like the new hotel and its surroundings. It looks quite realistic. Most motels/hotels I stay in have that same look. Thank you Fisherman and Bullethead, glad you like what kind of atmosphere I'm trying to conjure up here. 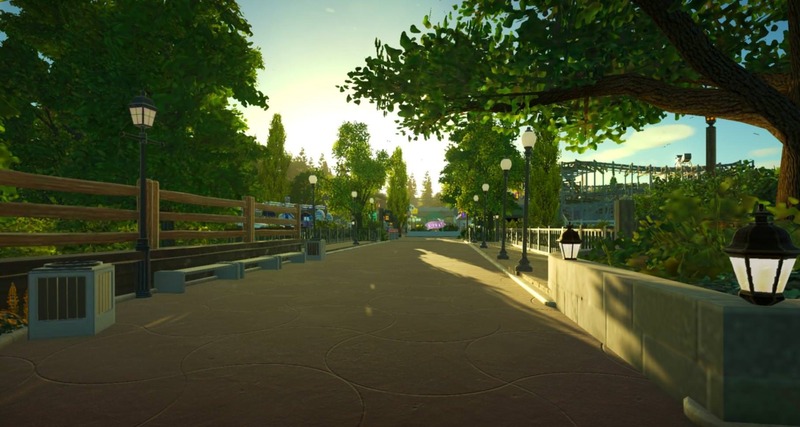 Just a quick thought, what parks are you actually kinda reminded of, if any, or certain areas? Would be really interesting to know. 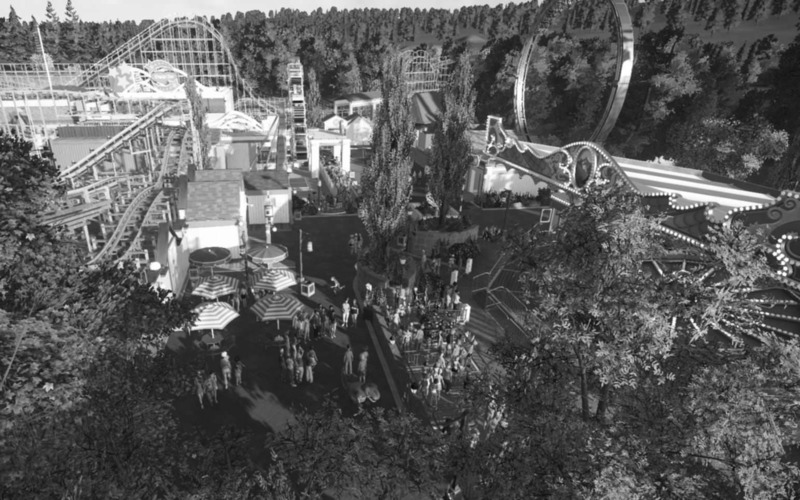 As for Sycamore Grove, this picture gives you an idea of the extent of the property at this moment, with the Log Flume / Arrow One-Two-Punch the park was getting more popular and had to extend their parking spaces. Seems like there was another building construction going on at the new lot. 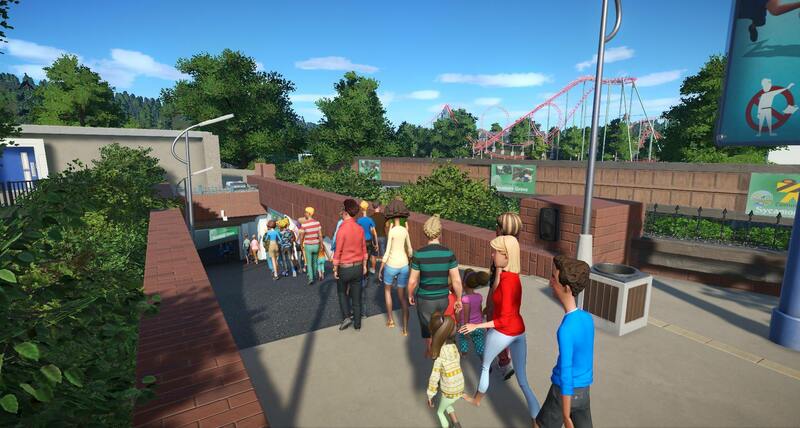 I also like how you were introduced to the park when arriving with public transport, with the tunnel acting as a transition between the park and the real world. With the music coming up, the moment you got to see the HYDRA rising up in the sky across the lake when coming out from underground must have been awesome. Where have I been? I just started at the top of the thread and bought your premise entirely, even pausing on picture 2 to figure out it wasn't real. This is some visual storytelling at it's finest. Thank you Redhair, if there's interest and a good spot for me to post, I could share some of our experiences at Walt Disney World and the whole planning process, since being severly underpaid social workers, we couldn't spend that much money and still got our dream vacation. So it's possible for (almost) everybody willing to prepare for a good year or so. JP, now that's something to start the week with Thank you too! 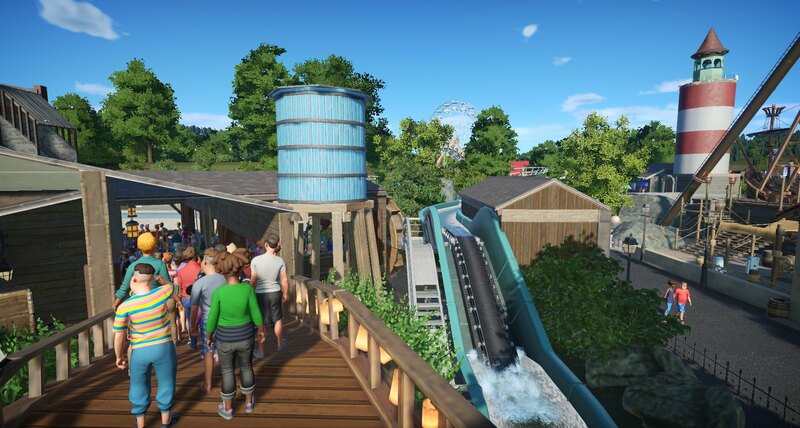 So after much talk about it, the park opened it's largest expansion to that date with the Arrow Custom Looping Coaster "Hydra" and a not specifically named Arrow Log Flume to go with it. 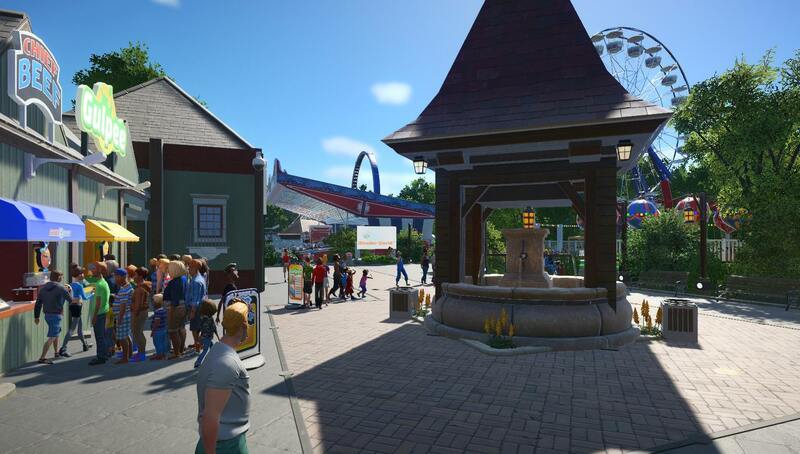 Also the park added two more Flatrides, the Venetian Caroussel and a Swinging Ship, but those went largely unnoticed by the crowd because of the two major attractions. The sound of the organ greeting guests who'd make a right turn just after the ticket booths and went on to the new area. The steep path to the left received many complaints and I believe was smoothed out during the season. 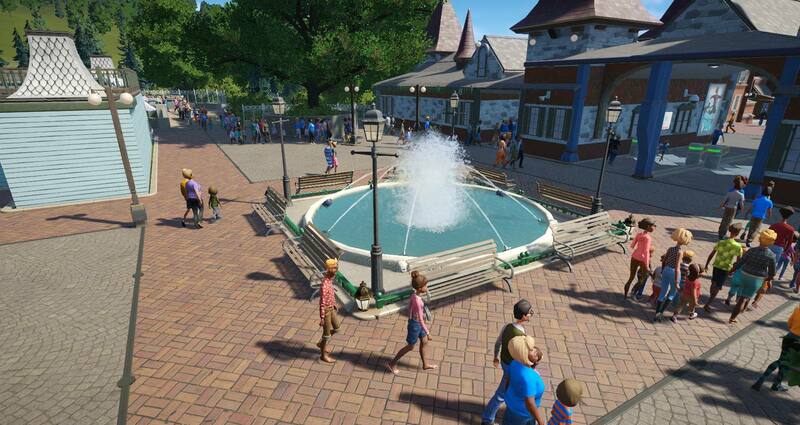 You'd pass the smaller drop of the Flume near the Caroussel, some water features soaked the guests even more. The big moment, queueing for the first time for the Log Flume. The layout was pretty much hidden in the landscaping and theming, only a couple of prominent spots were visible before riding. HYDRA was of the course the big draw for thrillseekers. With a stunning six inversions including a tunneled batwing, this ride knocked it out of the park (no pun intended...). 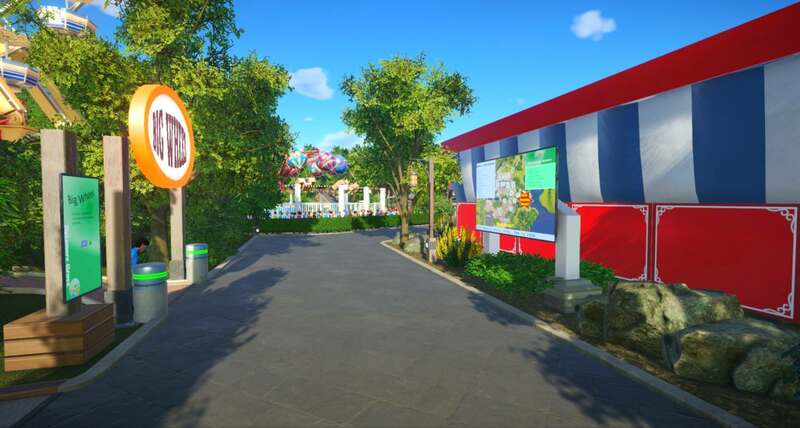 Also a couple more snack bars and facilities were added in this area. Exiting Hydra, you'd get this nice look over the new expansion. 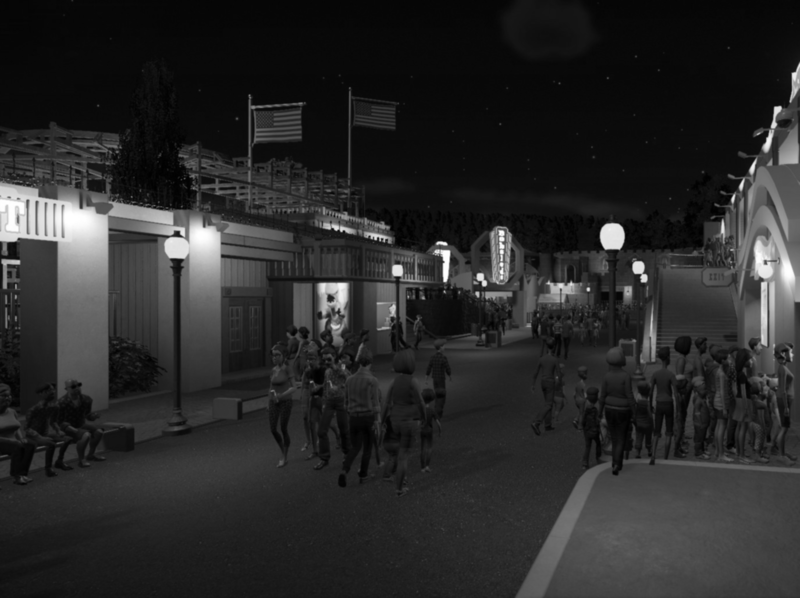 When the park was opened till night, the looming music of Hydra added much to the atmosphere around here. The highest point of the log flume before the big drop also made for a good view. And another shot from top of the lighthouse. I don't know if it was ever open to the public, but somebody went up there and took a couple of shots. 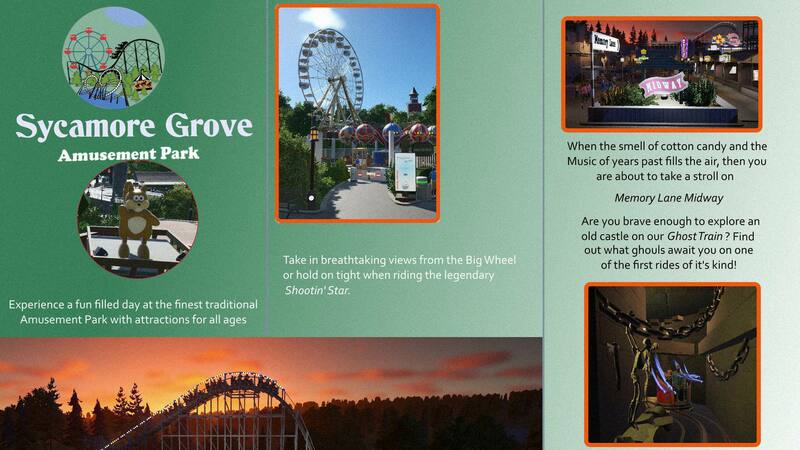 So there we are, Sycamore Grove now firmly back in business, sometime in the eighties, with the first hotel, transportation added, state-of-the-art rides, a good reputation and ground broken on the new parking lot and further expansion. I guess managment was pretty content at this state. I do not remember the wall. But there is the flying turns again, so... maybe they had it? I find the look of the new expansion quite attractive. Just the right amount of stuff to my taste, nothing overdone, nothing too minimalist, but everything neat, tidy, and tastefully arranged. It gives the look without being the look, emphasizing but not overshadowing the attractions. That's just how I like things., I wish I could pull off that look so well . 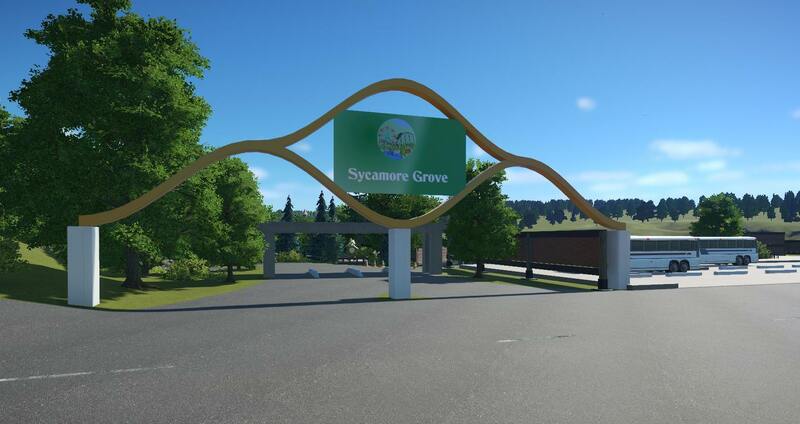 I love the presentation of Sycamore Grove. 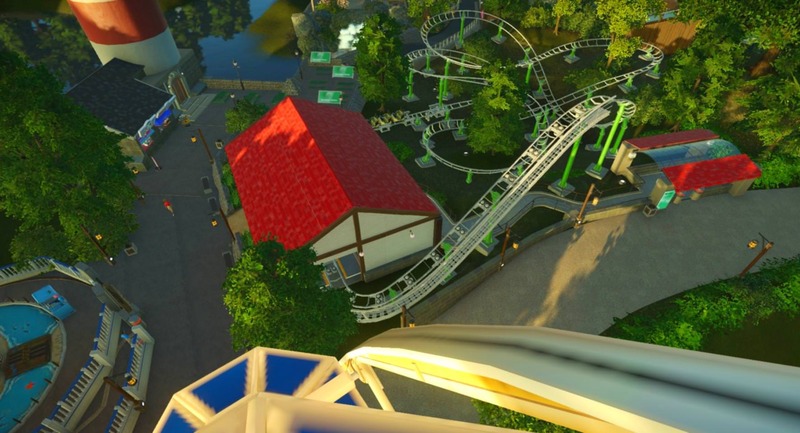 The near perfect blend of steel thrills and lush greenery adds it's own layer of charm. Everything fits neat and tidy and flows together well. Hydra is a step in the right direction now that the infrastructure is there. 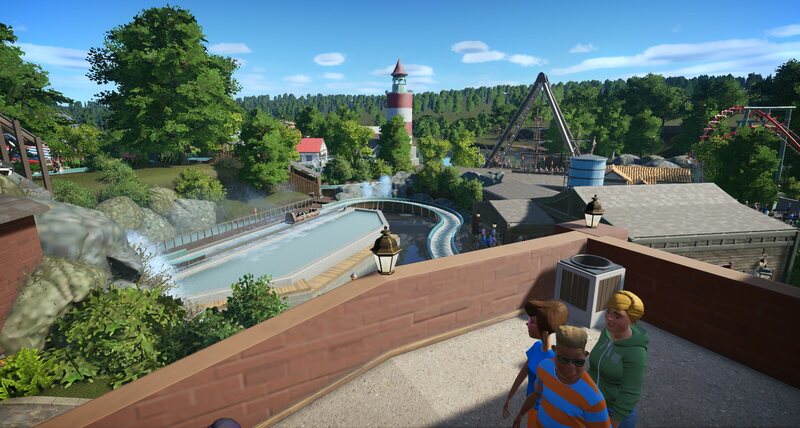 The way everything's set up, it could give Cedar Point a run for it's money in the future. I will be keeping an eye on this one.